Amentior: What's Amentior About This? 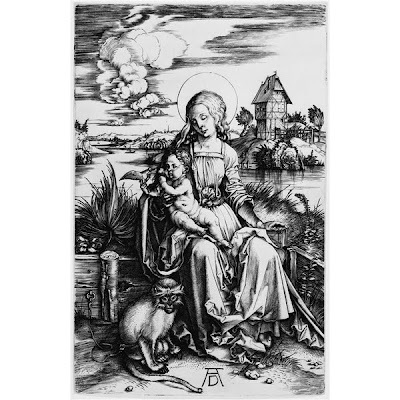 Albrecht Durer's Virgin and Child with monkey I saw this print today and thought of someone. But Cathy, can you find the hidden waffles?! Belinda: No. I'm still looking for the hidden buckwheat pancakes! I located a piece of art work on the net that depicts our blessed mother with some view master reels, but it maybe considered by some as blasphemy so I haven't posted it but when I look at it I think - she's a very modern woman and probably fun and she knows about the details of our lives including face book, television etc.. causing her much to pray about. I often consider our saints of old as being very contemporary. I think I've seen this before, or perhaps a similar painting.